Mall mania has hit Mumbai in recent years, with new malls popping up all over the city and an influx of global international brands. However, only the large, well-performing malls have remained open (and in many cases, expanded). Most of these malls are more than just shopping destinations. They've got huge food and entertainment zones as well, offering fun for the whole family. Unfortunately, many of the malls are located in Mumbai's suburbs. This makes them quite inaccessible to the average tourist, although local residents will be able to find a mall nearby. The distinctive tall chimneys at the High Street Phoenix mall complex, conveniently located in central south Mumbai, give away the fact that this area used to be full of textile mills before it was redeveloped. This diverse mall, which now measures 3.3 million square feet, was launched in 2008. It's grown to incorporate the new high-end Palladium Mall and luxury St. Regis hotel (formerly the Palladium), swanky Skyzone shopping space with national and international stores, and Grand Galleria Zone that's designed to lure impulse shoppers. You'll also find a courtyard containing food outlets, bowling alley, gaming arcade, and sports bar. All together there are about 500 brands. In the evening, head to the nearby restaurants and bars for a meal or drink. Address: 462 Senapati Bapat Marg, Lower Parel. Opening Hours: 11 a.m. until 10 p.m. daily. One of Mumbai's newest mega malls and one of the largest shopping malls in India, Phoenix Market City launched in late 2011 in the city's eastern suburbs. In contrast to the crowded area that it's located in, this cavernous mall is serene and spacious -- so much so that it often feels deserted. Measuring around 4 million square feet, it houses about 600 premium Indian and international stores, 100 food and beverage outlets, a 14-screen PVR cinema complex, and a massive entertainment area that often holds live performances of international artists. Key department stores and brands include Lifestyle, Reliance Trends, Pantaloons, Marks & Spencer, and Zara. Address: L.B.S. Marg, Kurla West. Opening Hours: 11 a.m. until 11 p.m. during the week, and until 1.30 a.m. on weekends. R-City mall is situated about 10 minutes up the road from Phoenix Market City mall. Phased development since the mall opened in 2009 has seen it expand in size to 1.2 million square feet. It now has more than 60 food and beverage outlets, many of them in its huge outdoor courtyard. Much-loved favorites include Indigo Deli and Moshes. 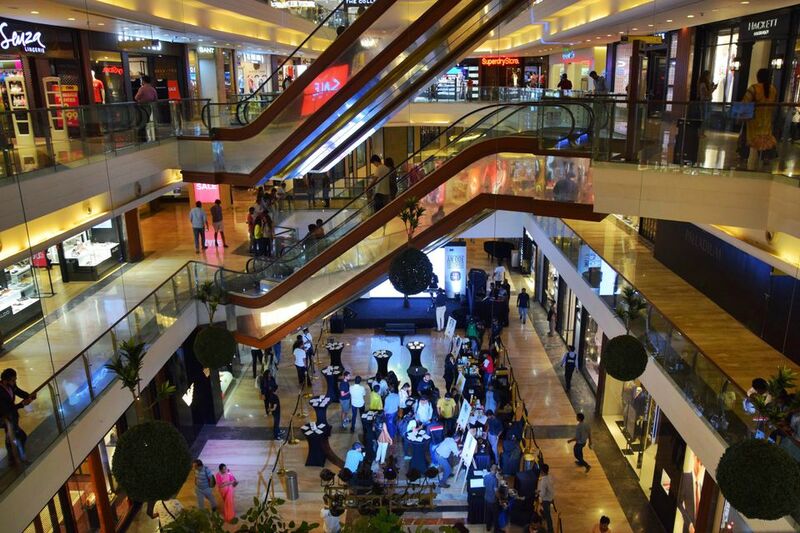 The mall also has 10 major department stores (such as H&M, Globus, Big Bazaar, Pantaloons, Westside, Lifestyle, Shopper Stop, and Marks & Spencer), a food court, INOX cinema, and plenty of options for entertainment. These include Snow Kingdom, KidZania, Red Carpet Wax Museum, TimeZone, Click Art Museum, laser tag, and live escape games. It's an impressive mall! Opening Hours: Weekdays, 11 a.m. to 9:30 p.m. Weekends, 11 a.m. to 10.30 p.m.
Infiniti, the "mall with infinite experiences" has a noteworthy claim to fame in Malad -- it's the first mall in India to have a roller coaster inside it! Launched in 2011, the mall measures about 1 million square feet and is one of the largest in the western suburbs. It has many high-end international brands such as Zara and Sephora, a good range of fine dining restaurants, a cinema with five screens, plus popular bar Hoppipola. Key department stores include Westside, Pantaloons, and Big Bazaar. Fun City launched its biggest kid's playzone in India at the mall in September 2017, which is an added attraction for families. Live performances and special community-led events are often held as well. Address: Link Road, Mindspace, Malad West (outer western Mumbai). Opening Hours: 11 a.m. to 10 p.m. daily (food court open until 11 p.m., and midnight on weekends). InOrbit opened their first mall in early 2004, in Malad. Although it's not as big as nearby Infiniti, this mall has about 500,000 square feet of retail space, a cinema, a substantial food court, plus a large Timezone entertainment center that was launched in 2014. To add to its appeal, the mall was recently given a facelift with a new facade, and number of new stores were added including MAC cosmetics and H&M fashion. The Beer Cafe has also opened a branch there. Other key stores include Lifestyle, Project Eve, Jack & Jones, Levi's, and Fab India. Indigo Deli, the Irish Times and Maharaja Bhog are the major food and beverage outlets. Address: Link Road, Malad West. Opening Hours: 11 a.m. to 9.30 p.m. daily (food court open until 11 p.m.). Oberoi Mall opened in mid 2008 and provides about 550,000 square feet of shopping, dining and entertainment over three levels. It isn't as big as some Mumbai malls. However, with a motto of "Fun, Food, Fashion, Films", it's one of the most popular ones. The mall aims to offer something for everyone and is known for embracing change. It facilitated the entry of many international brands into India (including Forever 21, Jack & Jones, and Starbucks). Its key stores are Zara, Gap, Marks & Spencer, Central, and Lifestyle. The mall's top level has a large food court, cinema and gaming area. It also houses some excellent restaurants and bars, including the British Brewing Company, Social, Olive Bistro, Maharaja Bhog, and a newly opened branch of hip Farzi Cafe. In addition, this environmentally-friendly mall was first in India to be awarded Gold certification in Leadership in Energy and Environmental Design (LEED) for existing buildings by the United States Green Building Council (USGBC). Address: Oberoi Garden City, off Western Express Highway, Goregaon East. Growel's 101 is India's first theme-based mall, with a Venetian design featuring Neo-Classical architecture to create a European feel. The 750,000 square foot mall and has undergone a remarkable evolution since it opened as a local neighborhood mall in 2005, with a Big Bazaar hypermarket and multiplex cinema. The second phase was launched in 2010 with the addition of food and beverage outlets, and retail stores including Pantaloons, Reliance Trends, AND, Global Desi, Nike and Puma. The mall further refined its offerings in 2015 by introducing more premium brands such as Central, Chroma, and Starbucks. This strategy is expected to continue in forthcoming years to expand the brand mix. Another distinguishing feature of the mall is its large open space where activities for children are held on weekends. Be prepared, as it does get crowded then! Address: Akurli Road, off Western Express Highway, Kandivali East. Opening Hours: Daily from 11 a.m. until 10 p.m.
Infiniti opened its first mall in Andheri at about the same time as InOrbit launched in Malad, in 2004. It's a smaller mall covering 310,000 square feet. Inside, there are 65 stores, a six-screen cinema complex, food court, restaurants and family entertainment center. Key Indian department stores are Westside, Pantaloons, and Food Bazaar. Other fashion brands include Pramod, AND, ONLY, Global Desi, Biba, Levi's, and United Colors of Benetton. Zaffran is a fine dining Indian cuisine restaurant there. Address: Link Road, Oshiwara, Andheri West. Opening Hours: 11 a.m. to 10 p.m. daily. Inorbit launched their second mall in Vashi, in Navi Mumbai, in October 2008. It revolutionized retail in the area and immediately became popular as it made big brands available to shoppers for the first time. The key stores at this 550,000 square foot mall include HyperCity, Shopper Stop and Home Stop, Westside, Landmark, Wills Lifestyle, Globus, Jack & Jones, and Fab India. The mall also has 34 eateries such as British Brewing Company, Chili's, Zaffran, Starbucks, and Moshes. There's also TimeZone for entertainment. Address: Palm Beach Road, Sector 30A, Vashi, near Vashi Railway Station, Navi Mumbai. Opening Hours: 11 a.m. to 9.30 p.m. daily. This historic mall in south Mumbai opened way back in 1999 as Crossroads, and heralded the beginning of modern retailing in India. McDonald's was its main anchor store. The mall was relaunched as SoBo Central in 2010 by its new owner. However, the Central department store was later replaced by discount retail chain Brand Factory. Unlike many other malls in Mumbai, this one focuses on affordable fashion for everyday wear rather than high-end luxury items. It's spread over 150,000 square feet and four buildings. Address: 28, Pandit M M Malviya Road, Haji Ali, Malviya Nagar, Tardeo.